For everyone who lived through this Connecticut winter (and did not have the time nor resources to build a snowbike) this past Saturday, March 5 was one of those days when you think Spring has come early. Though other parts of the state seemed to have less than desirable weather, Fairfield County saw temperatures rise into the low fifties, though with some wind and cloud cover. My wife planned to spend the afternoon in Manhattan, and I originally thought I'd take the Dahon in as well to ride around New York City before meeting her for dinner. Instead, I decided to wait for an even nicer day to take a ride in Manhattan and instead took one of my favorite rides: through the Cove neighborhood of Stamford, up Rt. 106 through Darien and into New Canaan, and turning around and heading south on Rt. 124 back to Rt. 1, which I'd follow back into Stamford - which is about 19 or 20 miles. I picked the route out years ago, when the recumbent was the only bike I had and its performance as a bike and my performance as a cyclist was more unreliable. 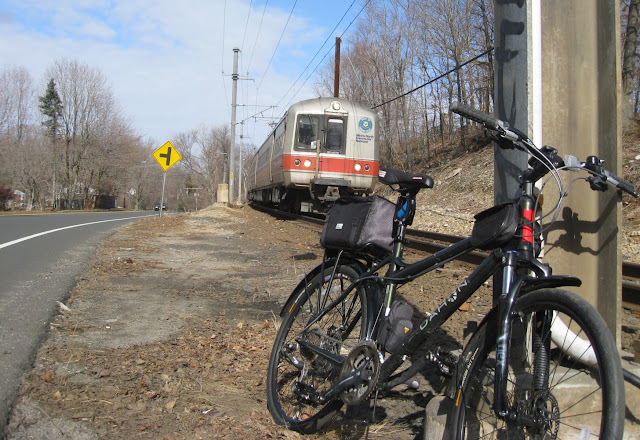 I reasoned that if anything happened to me or the bike on the ride, I'd never be more than a couple of miles away from a Metro North station that could take me home. Of course, now I have other bikes, and this time I took the Dahon since I had cleaned and tuned it earlier in the week expecting to take it to New York. 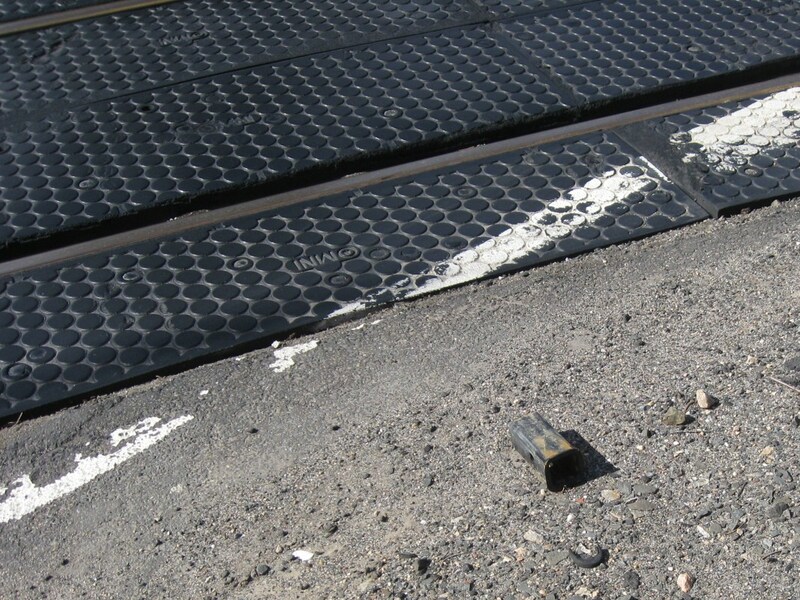 About six miles in, there's a railroad crossing on Rt. 106 where I stopped to drink a little bit of water. Immediately after this photo was taken, the crossing gates just behind me began to go off and the gates began to come down, so I quickly moved the bike out of the way to take the photograph that appears at the top of this post. Once the train passed, I looked at a large piece of metal I saw near the tracks: it was a piece of a 2" trailer hitch, which may have fallen off a vehicle passing over the crossing. You'll notice the Dahon has a rear rack in the photos and a bag, and you'll remember I do some welding. Picking up a large hunk of metal six miles into a 20 mile ride isn't something most people do (probably) but I did. I just know it'll be useful for something. 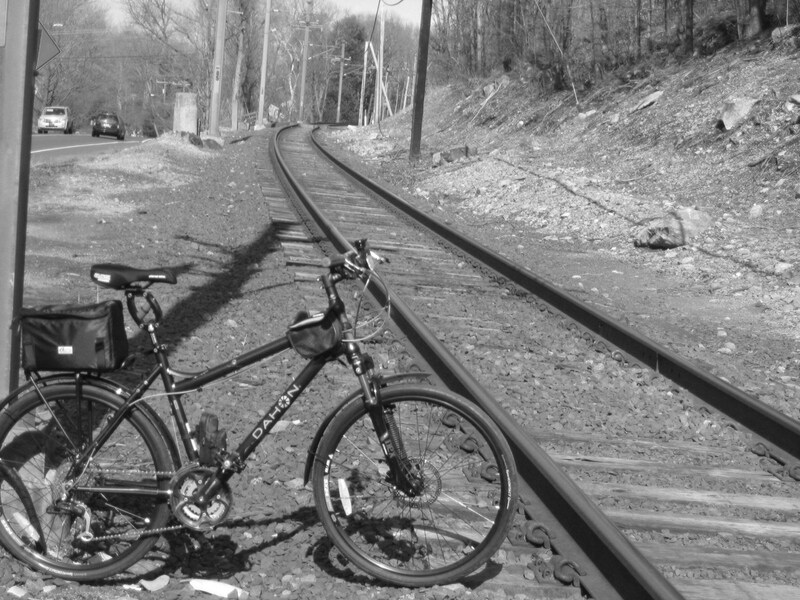 Getting back on the (now heavier) Dahon, I continued north, with the Metro North tracks on my right for another two miles until a steep climb over by Weed Street, when the tracks pass overhead. To psyche myself up for the climb, I usually try to think of that scene in Empire Strikes Back when Yoda levitates Luke's sunken X-Wing fighter out of the swamp. I'm not sure if it's motivational ("Master! I don't believe it!".... "That, is why you fail.") or just a nice mental diversion, but it works, and before long I arrived in New Canaan. I often take this ride on Sunday mornings when I can stop at Connecticut Muffin Company for a coffee, but I arrived around 2:00 on a Saturday afternoon, so a different treat was necessary: I pedaled down Forest Street past Cava and the great Mexican restaurant Tequila Mockingbird to see if Gelatissimo Artisan Gelato was open. It was. 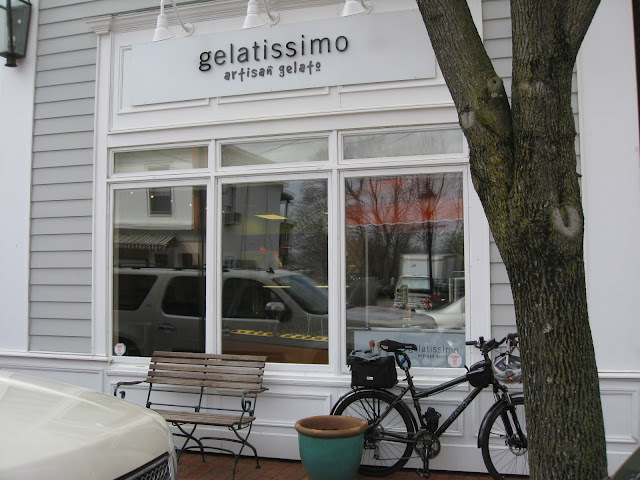 A happy young woman behind the counter took my order, and I sat down to enjoy a medium cappuccino gelato. Though I wanted to savor it, I ate it fast (but managed to avoid getting a brain freeze) and afterward I got back on the Dahon and began heading south toward Darien on Rt. 124. On the way I saw a number of sights that read PUZZLETHON that had an arrow pointing down a side street. Puzzled, I decided to follow the signs and see what it was all about. At the South Elementary School in New Canaan, some friendly people told me that the puzzlethon was a a fund raiser for ASCONN (formally the Autism Society of Connecticut) and it was their fifth annual puzzlethon event. If you want to help ASCONN and participate in the puzzlethon, you can visit their web site or puzzlethon.org to take part (I also learned the puzzlethon continues on April 2nd in Fairfield (Sacred Heart University) and in New Haven (Southern Connecticut State University). I left the Puzzlethon and continued south into Darien before taking a right on Rt. 1 and heading back into Stamford. I stopped at Fairway Market in Stamford to buy a few groceries that would fit in my little backpack and then pedaled home. The Puzzlethon and Fairway diversions helped make the ride exceed 22 miles altogether. I put the groceries away and later, to satisfy my curiousity, weighed the trailer hitch piece I had been carting around for 14 miles. 3.5 pounds. In other words, about 10% of the weight of the Dahon Matrix. Oh well, I thought. I wasn't in a race, I had a fun ride and now I had a new piece of metal for the welding room. Good day.